Gretchen Reynolds’ Message On Healthy Workplace Habits: Stand Up! In a recent interview with Terry Gross on the NPR program Fresh Air, Gretchen Reynolds talked about her new book: The First 20 Minutes: Surprising Science Reveals How We Can: Exercise Better, Train Smarter, Live Longer. Of the many messages related to exercise that Reynolds discussed, one in particular stood out (pun intended) to me. That message: Stand up! I have attempted to capture the details of that message in the sketchnotes above. Many of us spend a large portion of our day sitting down, and the consequences of such a sedentary lifestyle can be severe. The good news is that it isn’t too hard to adjust your work habits to mitigate those effects. The crux is this: stand up for at least two minutes every twenty minutes. If you can walk around during those twenty minutes, even better. Reynolds recommends making a simple and affordable purchase to help you get out of your seat throughout the day: a music stand. 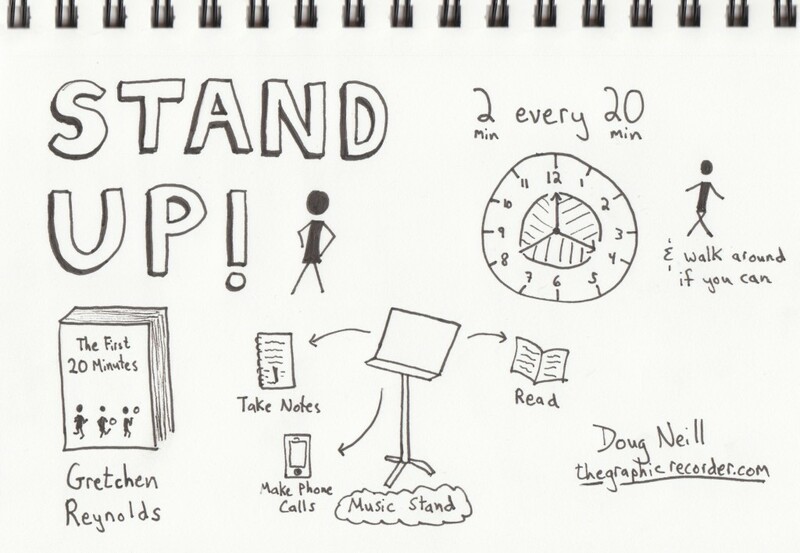 You can use the stand while reading or taking notes. Another good habit to get into is standing up while making phone calls. If you need to jot something down during the call, just head over to the music stand! I currently have a somewhat bulky stand-up desk, but I like the size and simplicity of using a music stand instead, so I plan on picking one up so that I can see how much I enjoy reading and sketching while standing.